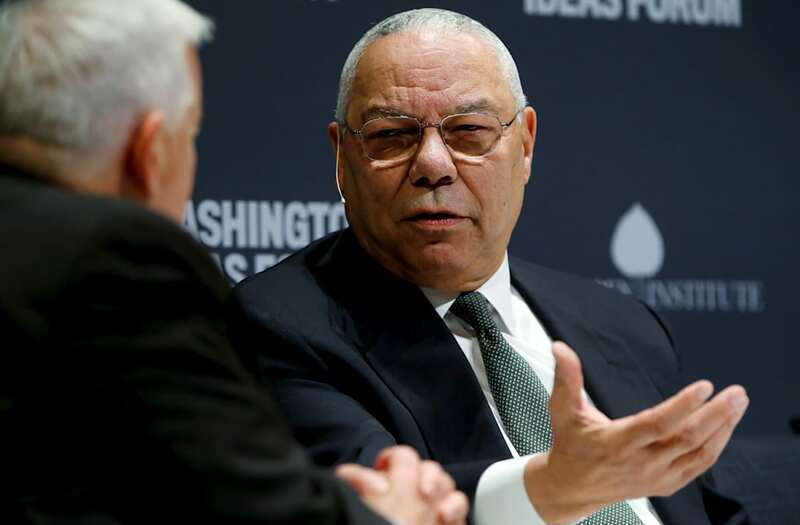 Colin Powell has served as secretary of state, chairman of the Joint Chiefs of Staff and commander of the U.S. Army Forces Command -- but the four-star general's current work with America's Promise Alliance might be his most memorable career chapter yet. America's Promise is the nation's largest multi-sector Alliance focused on the well being of young people. Powell and his wife, Alma Powell, who are former and current chairs of America's Promise, released a letter to the nation today marking the Alliance's 20th anniversary -- a milestone the non-profit is marking with a "Recommit 2 Kids" campaign. In the letter, titled "Our Cause: A Letter to America," the Powells describe Americans as "part of a great chain that is near to breaking in places" when it comes to valuing youth living in the United States. A product of The Presidents' Summit for America's Future, America's Promise was founded in 1997 when former presidents Bill Clinton, George H. W. Bush, Jimmy Carter and Gerald Ford (with former first lady Nancy Reagan representing President Reagan) came together to make children and youth a top national priority. After chairing the summit through which America's Promise came, Gen. Powell then became the chairman of the Alliance. Today, America's Promise advocates for "The Five Promises," which are caring adults, safe places, a healthy start, effective education and opportunities to help others. These, the letter reads are "the minimal conditions that every child, in every neighborhood, has a right to expect." "When it comes to young people, we do not need to reinvent the wheel," Mr. and Mrs. Powell write. "We need to summon the will." AOL News had the chance to ask Gen. Powell and Mrs. Powell about their work with America's Promise, how the non-profit has adapted to changing political climates and about the issue of supporting youth -- which Gen. Powell calls "the domestic challenge of our time." Q: How have the issues America's children face evolved since America's Promise Alliance was founded 20 years ago? Gen. Colin Powell: In many ways, young people today are much better off than they were 20 years ago. High school graduation and college attendance rates have gone up, while teen pregnancy and teen drug and alcohol abuse have declined. We've also seen the expansion of high quality early childhood programs and health coverage. That progress is significant, but it's not evenly distributed. Young people of color and children from low-income families are still less likely to graduate high school than their peers, and child poverty rates in America remain unchanged. We can't forget that the issues that affect adults ultimately affect children. Parents today are asked to do more with less, while the communities and institutions they've historically relied on for support are increasingly fragmented. These issues are the enemies of young people's success, and solving them is the domestic challenge of our time. Q: What role can the federal government play in promoting the "Five Promises" America's Promise advocates around? Gen. Colin Powell: The federal government has an important role to play but so does government at every level – state, city, county, township. Private business has an important role to play, in partnership with government and with nonprofit organizations, to help young people get on a path to success. And each of us has a responsibility to the nation's young people. Supporting children is not only the work of a government; it is the work of a people. That said, politics and policy are clearly important to children's futures. Communities must have an economic floor that none can fall below. Children need access to adequate nutrition, and parents need access to quality childcare and quality schools. And the systems that serve our most vulnerable children—those in foster care, juvenile justice systems, and young people experiencing homelessness—must honor and preserve the promise of every child. U.S. Secretary of State Colin Powell (R) points as he shakes hands with Russian Foreign Minister Igor Ivanov in Cairo February 24, 2001. Both men both men are expected to discuss arms control, Iraq and Middle East peace. Powell said his meeting with Ivanov would be a "get acquainted session" and the start of the engagement between the new Bush administration and the Putin government in Moscow. U.N. Secretary-General Kofi Annan (2ndL) reads a final statement beside (L-R) Russian Foreign Minister Igor Ivanov, Spain's Foreign Minister Josep Pique, U.S. Secretary of State Colin Powell and EU Foreign Policy chief Javier Solana during their joint news conference at Moncloa Palace April 10, 2002. Leaders met to discuss the Middle East crisis. Q: Where you advocate in your letter for public schools to have "high standards, high expectations, and high support for every student," what is the number one priority you'd like to see? Gen. Colin Powell: We are a nation that spends vast sums of money, but devotes far too few resources to the development of children. This is a scandal of misplaced priorities. Building sustainable school communities and ensuring equitable school funding are critical for helping to level the playing field for kids today. We also have more to do to close graduation gaps by race and family income and for students who are English-language learners, students with disabilities, and students who experience homelessness. And we have to do more to ensure that all students who graduate from high school are prepared for postsecondary education and the workforce. The future of our country depends on the success of our young people. Q: What is the single greatest barrier between today's American youth and their path toward a successful life? Mrs. Powell: Children in this country have always had to overcome enormous odds and systemic barriers to reach their American Dream. Our research has shown that the presence of stable, trusting relationships in the lives of young people is a key factor – perhaps the key factor – in keeping them in school and on a path toward success. So, while there's no shortage of problems to choose from, the worst thing that could happen to young people is our failure to act on their behalf. When we believe in young people, they believe in themselves. Q: As current chair, how do you see America's Promise adapting to the current political climate as the foundation addresses policy concerns on a state and local level? Mrs. Powell: America's Promise has always been a nonpartisan organization, a safe space for collaboration with all who care about the health and progress of children. Our founding 20 years ago brought together all living U.S. presidents to rise above partisan divides and make children a national priority. We will always believe in the power of that collaborative spirit. Through the work of our signature campaign, GradNation, we've learned that real change for young people happens in communities. Thanks to the work of millions of students, families, educators, policymakers, and community leaders, the nation's on-time high school graduation rate is up from 65.7 percent 20 years ago to a record 83.2 percent today. As we work toward our goal of a 90 percent national graduation rate by 2020, supportive policies that help to ensure accountability and appropriate data collection will be very important. Q: The #Recommit2Kids campaign has been a central pillar of America's Promise Alliance 20th anniversary celebration. What would you say is the most valuable way America can commit to its youth in a substantive manner? Mrs. Powell: If our research and experience have taught us anything, it's that there is no single idea that can support America's young people on its own. The success of our children and youth depends on many overlapping factors. While much has changed in the past 20 years, children's needs have remained constant. Young people need caring adults creating webs of support around them, stronger family engagement and support, connected pathways from school to the workforce, and smart and fair investments in their futures. If every American did just one thing in this cause to recommit to kids, the future of our country would be transformed. And every one of us can do something, whether it's volunteering at your local Boys & Girls Club, donating to a youth-serving organization or being a caring adult in the life of a young person. Instead of searching for a single solution, we should strive to summon a collective will.